Under contract by several major news organizations, LDG relied on 12 Litepanels Gemini panels to light the networks' temporary sets overlooking Windsor Castle in London. "We have been using Litepanels products for years, and they've given us consistent and reliable service," said Niel Galen, senior lighting designer, Lighting Design Group. "Gemini is a welcome addition to the world of LED soft lights. Its lighter weight and smaller form factor were big pluses for this shoot because we had very critical weight restrictions for the install given the age of the building." 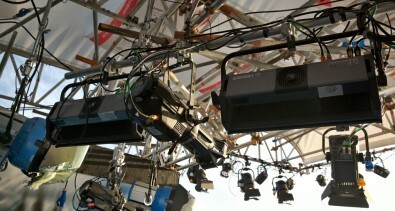 In London, LDG used the Gemini in a lighting solution for the networks' temporary broadcast booths, which were located directly adjacent to Windsor Castle. The Gemini soft panels worked in tandem with traditional HMI lighting to match daylight lighting conditions on the sets, from which the networks broadcast live morning shows and prime-time newscasts on May 18 and 19. "In our lighting design for the wedding coverage, we were going for a very pleasing soft, but also sparkly, light," Galen added. "The Geminis were an important component and performed beautifully. They provided a fantastic soft base with strong and consistent output, which can be difficult to find with other fixtures, and their comparatively low power consumption was a big help since we were running off generator power. We're always leery of using products that we have not field-tested, but the Geminis worked exactly as expected, with no surprises."